This recipe is adapted from one for quail. it involves brining, roasting with a basting liquid and then glazing. 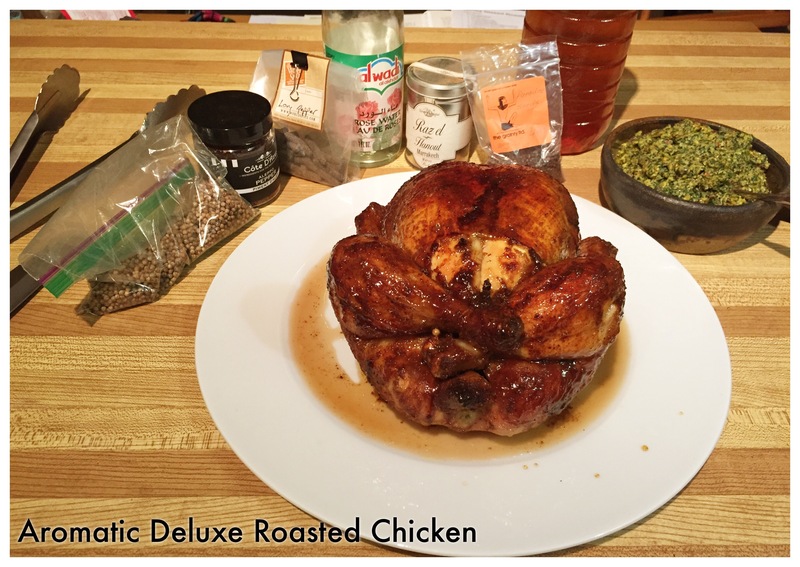 There are a number of exotic spices in this recipe, so I’ll recommend right here if you don’t have a local specialty store, check out World Spice Merchants for stock of anything you don’t have. 1 whole chicken, approx. 3 lbs. Put water in a medium pot. Add all spices, salt and sugar and bring to a boil. Set aside. Add ice and stir till it melts. Once brine is cool, transfer to a pot large enough in which to submerge the chicken. If necessary, put a plate over the chicken to keep it submerged. Refrigerate for 2-1/2 hours, or overnight. Preheat oven to 375F / 190C. Remove the chicken from the brine and pat dry. Set aside on a roasting pan to bring to room temperature. Meanwhile, prepare the basting liquid: melt butter, add spice and rose water and whisk to combine. Remove from heat. Baste chicken liberally with basting liquid (about half should do it). Roast for approximately 45 minutes, then pull chicken from oven and baste again. Roast another 45-55 minutes or so, until internal temperature reaches 170 F (test both the leg and the breast). Pour the honey into a small pan and heat at medium till runny. Add white wine and coriander; stir to combine. Let glaze reduce by about half, which should take about 5-10 minutes (it will thicken). Once chicken is cooked, remove from oven and set aside to rest for approximately 5-10 minutes. (Meanwhile you can make final preparations for any veggies you are cooking. ) When you plate the chicken, drizzle warm glaze over top. You can take a hint from the title, and choose an aromatic white wine like Gewurtraminer for this dinner. An off-dry Riesling would work too, in a pinch. Cheers! This dish is excellent with Paradise Pistachio Relish, another recipe from World Spice Merchants on their delectable blog. Roughly chop pistachios by hand or in a food processor. Add parsley, mint, garlic and lemon to the food processor bowl (or combine everything in a medium bowl). Slowly add olive oil, mixing as you go, then add Aleppo pepper, grains of paradise and salt. Cover and allow to sit at room temperature for 1 hour.